– in 20 min-walking distance to the city center. 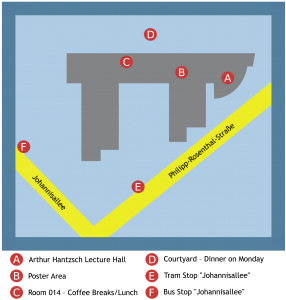 It can be accessed using tram lines 2 and 16 (tram stop “Johannisallee”) or 12 and 15 (tram stop “Ostplatz”) or by the bus lines 60 (bus stop “Johannisallee”) and 70 (bus stop “Deutsche Nationalbibliothek”). The conference office is located in the foyer of the building. On Monday, August 26th, 2013, it is open from 8 am on. All talks take place in the Arthur Hantzsch Lecture Hall on the ground floor. The poster sessions take place in the foyer. All coffee breaks and lunch take place in room 014, the dinner on Monday in the courtyard of the building and the dinner on Wednesday at the restaurant Bayerischer Bahnhof.